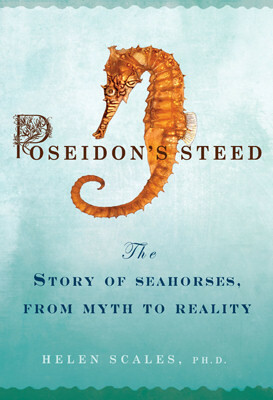 Poseidon’s Steed is marine biologist Helen Scales’ first book; its subject is the seahorse. The book is short – I read it in less than half a day whilst convalescing with a cold – but packed with everything that is interesting about seahorses. I am well acquainted with the pull that these (mostly) tiny creatures exercise on people – Tony has been obsessed with seeing a seahorse for years, and I was delighted to share in his first sighting during a dive in the Knysna lagoon just after we met. 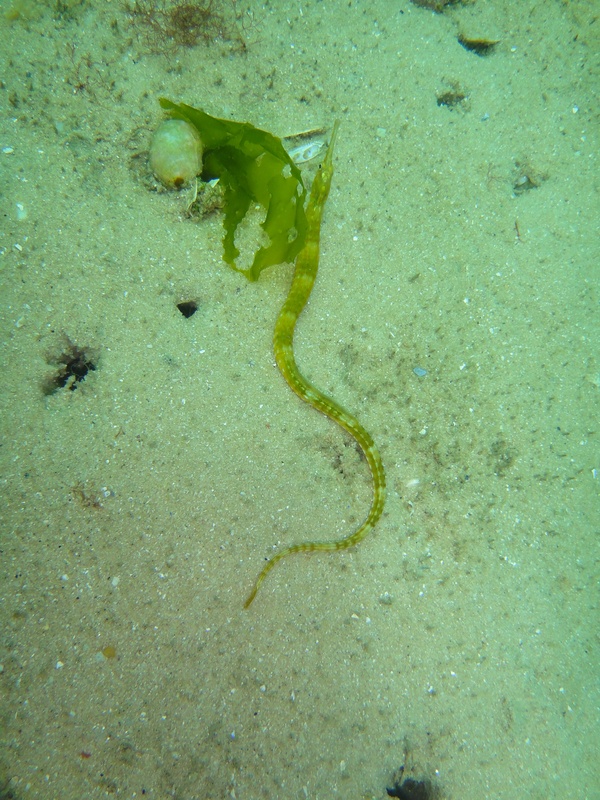 The Knysna (or Cape) seahorse, Hippocampus capensis, features towards the end of Scales’ book, where she discusses the threats to its habitat and its extremely limited geographical range. The first section of the book situates seahorses in culture, myth and history, and reveals that they have been venerated and depicted in art and design for thousands of years. Scales hops – seemingly – from topic to topic with great ease, and before you realise it she’s painted a complete picture of the seahorse and its role in human life for generations. Scales describes seahorse biology, clearing up for me the reason why we saw such colour variation among the seahorses we spotted in Knysna: they are able to change their body colour at will. This makes it tricky to differentiate species, but extensive research has placed the current known number of seahorse species at about 40. Unique among animals, the male seahorse actually experiences pregnancy, and these creatures exhibit great fidelity to their mates. Pipefish, those close relatives of the seahorse, are also covered. Seahorses are popular exhibits in aquaria – including tanks maintained by private individuals – and Scales traces the history of the aquarium from its origin in Victorian times, when it satisfied the prevailing mania for collecting and categorising. Husbandry of seahorses for aquaria is big business, and Scales mentions a company called Ocean Rider as an example of seahorse breeders. This takes the pressure off populations of wild seahorses, which are particularly vulnerable to human exploitation and pollution because they exhibit such habitat fidelity. Seahorses are also vulnerable because they have attained almost mythic status in Traditional Chinese Medicine (TCM), and are used to cure all manner of ailments. A chapter on their role as medicine gives perspective on the use of species from both the plant and animal world as medicine – Scales locates TCM nicely in history, tracing its development and explaining the difficulties of testing whether a specific item – such as ground up seahorse – can cure a specific ailment (the holistic approach taken by practitioners of this type of medicine means that each individual receives a very specific, tailored cocktail of medications). 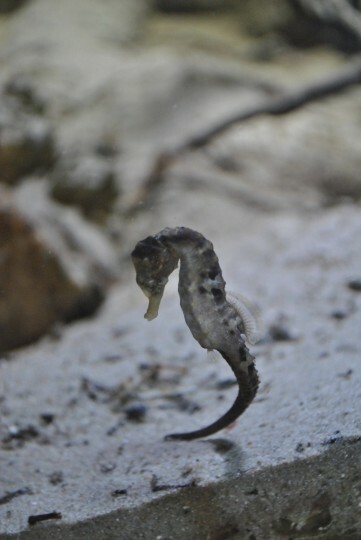 Project Seahorse began in 1996, in response to the realisation that harvesting of seahorses from their habitats was far more widespread and intensive than had been suspected. 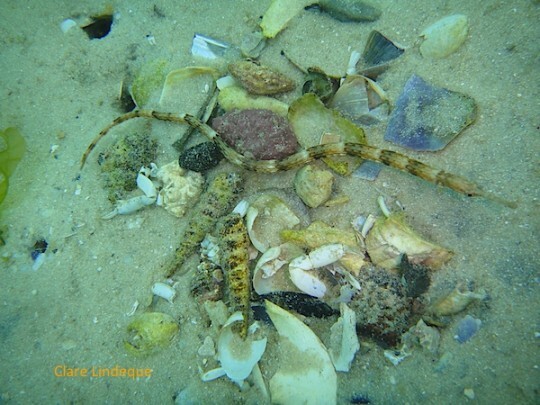 The project was piloted in the Philippines, and involved the local community – who derived income from the seahorse trade – in setting aside part of the ocean on their doorstep as a no-take marine reserve. The community also allowed researchers to measure and weigh the seahorses that they did harvest, and logged their catch daily for study purposes. The results have been encouraging, and it is clear that involving the local community – who make a living from the resource – in the conservation effort was key. Project Seahorse has subsequently expanded its reach and scope considerably. Seahorses do not perform a misson-critical role in our oceans; they are not a “keystone species“, and if we remove all of them our oceans won’t collapse and cease to function as ecosystems. In the epilogue, Scales quotes David Attenborough (from page 4 of this interview) as saying that the primary reason for conservation of our natural world is “Man’s imaginative health”. And this, I think, is the point: for us to have arrived, at the end of a process longer than we can adequately comprehend, and behave as though our late arrival gives us licence to wreak havoc on ecosystems that have existed – in balance, without interference – for aeons – is wrong. Just wrong. Whale sharks are one of the species referred to as charismatic megafauna – species with wide popular appeal that can be used as icons by conservationists and elicit disproportionately strong responses to appeals for their protection. Perhaps seahorses should be listed as charismatic microfauna (I’m not entirely sure that’s a formal name for anything!) – they seem to capture the imagination all out of proportion to their size. There is much to love about seahorses. You can buy the book here if you’re in South Africa, otherwise click here. If you want to read it on your Kindle, go here. Summer is on its way as can be seen by the southeasterly winds that are prevalent during the next few months. The plus side of this is it keeps the colder rainy days away and sends us diving on the Atlantic coast far more often than the False Bay coast. Today the visibility on the Atlantic side is reportedly top to bottom whilst False Bay has between 4-5 metres, less in some places. 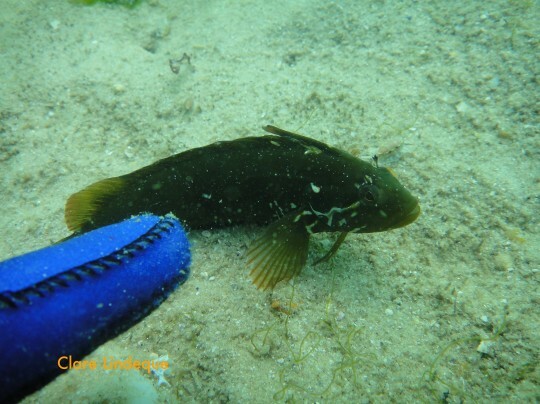 The downside to Atlantic diving is the temperature, a good few degrees lower than False Bay but with the cold water almost always comes stunning visibility. The boats tend to favour Hout Bay and OPBC for launching during these months. Rock lobster season is open (or crayfish as they are often called) which means the water will be filled with people trying to catch them for dinner. Due to the limits on numbers and sizes each person may take in a day the authorities are also all over the place watching and checking anyone that has been in the water almost daily. Whilst taking of rock lobster on scuba is illegal some people do and this is the reason they will pay you a visit as soon as you exit the water. 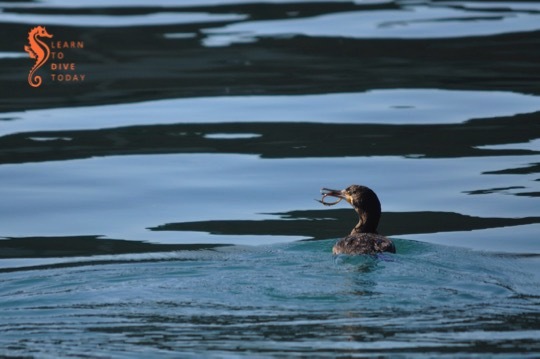 The first question will be “Do you have lobster?’’ and the next one will be “Where is your diving permit?” Diving in a Marine Protected Area (MPA) has required a permit for several years now. Its obtainable at the post office, costs around R98 and is valid for ONE year only. Please check your permit and make sure you have it with you when you arrive for a dive with us. You may be denied a dive or denied access to a boat without it as the stories of “arrested for no permit’’… “gear confiscated”… “boat confiscated’’… etcetera are rife. How much truth is there in these stories? I have no clue, but it is not worth taking the chance. 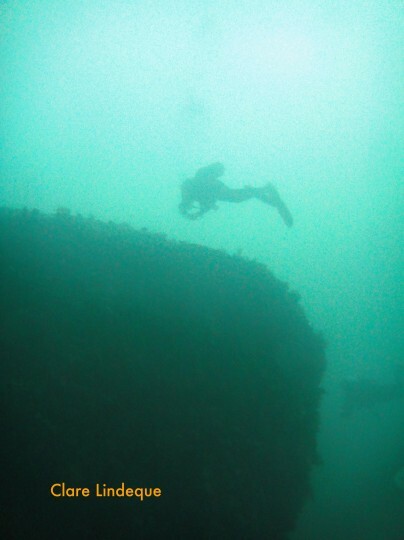 We did not dive much last weekend as I made a poor decision based on my interpretation of the weather – wrong call, as Grant had 15 metre visibility on the Lusitania. We did however spend some time in the pool with new students, and did one dive at Long Beach on Sunday. Still diving in my book. The week days have been better with diving on Monday and Tuesday delivering 6-8 metres at Long Beach and 8 metres on the wreck of the Clan Stuart. We will shore dive the Atlantic tomorrow and see if the visibility is as good as the claimed top to bottom. Grant will launch from OPBC and I have booked places on the first launch. Grant will do several launches on both Saturday and Sunday but many people love the clean cold Atlantic water so the boat will fill quickly. Don’t wait until Friday night to try and book. Please note that as of 1 November, prices for boat dives have increased to R220 per person per launch. I’ve included some pictures from last summer’s Atlantic diving to whet your appetite. We are doing the first launch to look for some depth for an Advanced course and then will do a few shore dives at Oudekraal. Saturday looks really good for a night dive, the swell is small, very little wind and there is still some moon. I will do a night dive at A Frame or the Clan Stuart if there is enough interest. 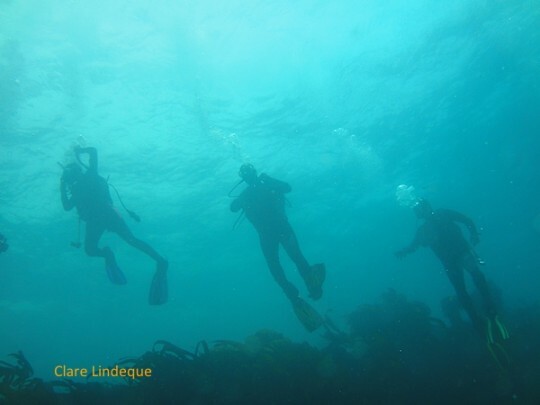 Sunday we will move back to False bay for Open Water students doing dives 1&2. A trip out to the tuna fishing grounds to dive with sharks and see amazing bird life has its special place in my style of diving. The whole cage diving and baited shark diving issue is a very contentious one and both sides have good strong arguments yet neither the yeah- or the naysayers have much in the way of scientific evidence. This is largely due to the fact that there is very little funding for such research. But never mind the science, as a diver it is far easier to make a judgment call on such a topic once you have experienced such an event. As with cage diving, baited dives need to be conducted in a safe and animal friendly manor to avoid injury to the sharks. Operators do exist that have respect for the ocean and its inhabitants and take care to ensure no harm can come to the animals. I want to plan a few trips to the open ocean to photograph and experience these creatures in their own environment. They take some planning and preparation as it’s a long boat ride and the conditions need to be perfect. If you are interested in these trips please mail me so I can start planning a few trips. 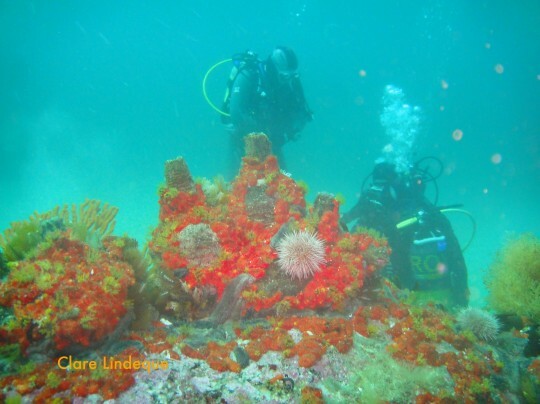 Newsletter: Winter diving is here! Finally the conditions that bring exceptional diving have arrived. The lack of any strong south easterly winds and the occasional days of northerly winds have started to clean up False Bay and we have had reasonably good conditions. It only gets better from here on. Saturday and Sunday were spent doing Open Water dive course training and we dived 5 DSD students. The conditions were great with good visibility and everyone had a good time. Wednesday we spent on the boat doing three dives one after the other. There were 15 of our divers for Grant to deal with during the day (and at least 15 mini chocolates eaten) and we covered the Deep Specialty, Open Water qualifying dives and fun dives. Clearly it was a heavy day because when I saw Grant this afternoon he was leaning on a walking stick! Clare has also achieved Master Scuba Diver status (Advanced plus Rescue Diver plus five Specialties plus 50 logged dives) not to mention she is our master photographer. We have a pile of CDs of photos at home for many of the people that dive with us full of your pictures and I will give them to you next time I see you. We did the first dive on the wreck of the SAS Good Hope and spent a brief time on the MFV Princess Elizabeth. Grant dropped the shot right between to two wrecks and the visibility was great so we could see both wrecks at the same time. We found a horsefish and then a bunch of pyjama sharks all curled up together. 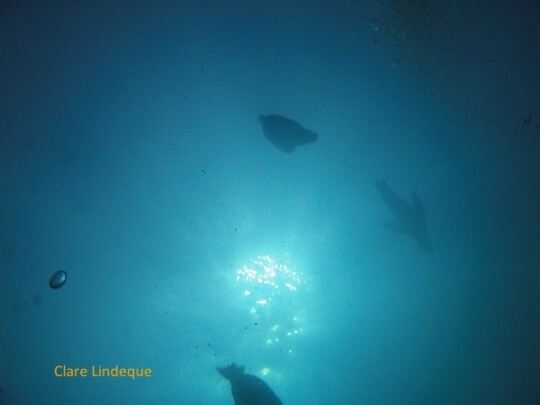 The second dive was to Pie Rock where Lindsay and Tinus qualified as Open Water divers (congratulations! ), and the third dive was to Outer Photographer’s Reef where we saw a few boxes of ammunition as well as a few scattered shells, walls of brittle stars, doublesash butterflyfish and had seals follow us around for the last half of the dive. Kate was continuing with her Deep Specialty course on this dive. The sea was flat, the visibility was great and all three dives were great fun. The conditions look set to repeat themselves this weekend so the boat is calling. Grant picks us up and drops us off at Long Beach with the boat so it is really easy. 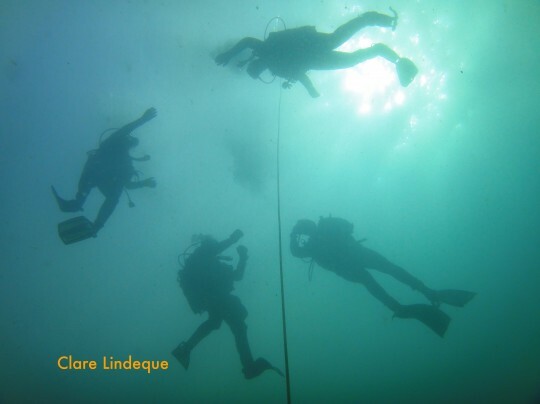 Any of the courses such as Advanced, Deep, Wreck and Photography can be started on these dives. On Sunday we will dive the sevengill cowsharks (max depth 12 metres) and or the Clan Stuart wreck (max depth 10 metres). The boat fills quickly on a weekend with such great conditions so text me as soon as possible if you are joining! 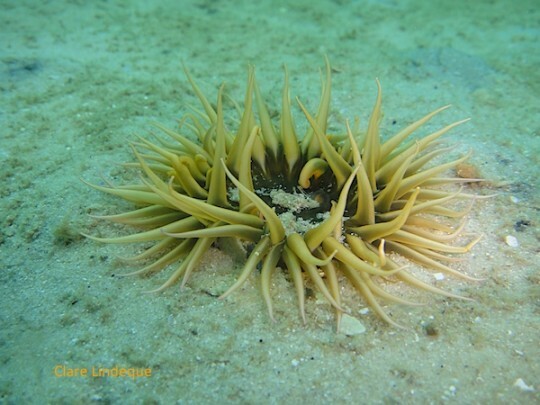 Posted on 19 May 2011 23 April 2014 Author TonyCategories Boat diving, Brittle stars, Deep specialty, Discover Scuba Diving, Master Scuba Diver, Newsletter, Open Water, Photography, Pipefish, Reefs, Shore diving, Visibility, Wind, Wreck diving3 Comments on Newsletter: Winter diving is here! Tony and I installed a small artificial reef on the sand at Long Beach on 20 November last year. We checked on it after 10 days, and again after nearly 4 weeks, and then did not visit it for an extended period of three months during which the visibility was very bad. 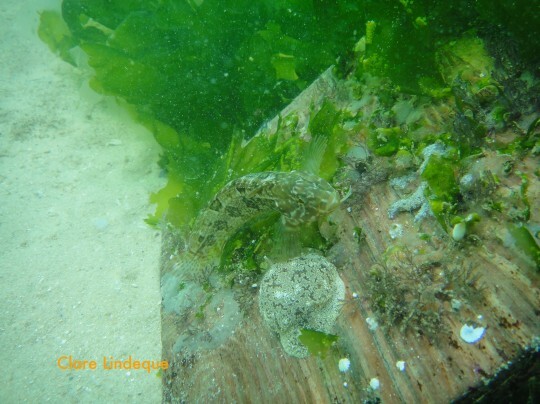 Summer diving in False Bay is an exercise in patience! We visited it again recently, but my camera battery had given out after too much diving and photography for one little camera for one day. 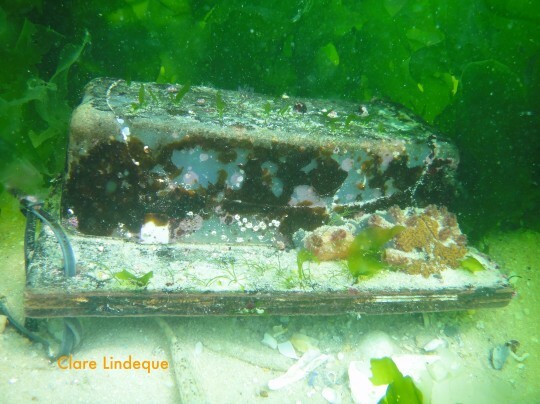 We returned to the artificial reef on Saturday 19 March, after it had spent 119 days in the water (4 months). 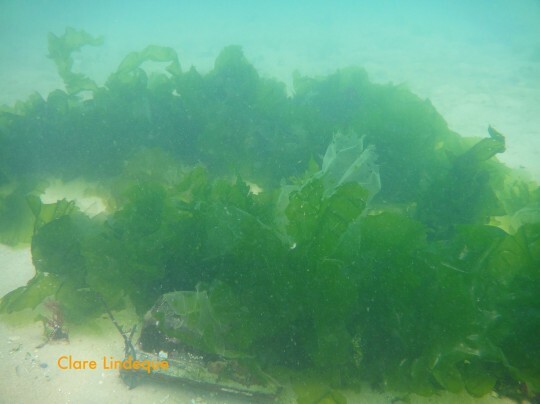 The reef itself is now so covered with sea lettuce that we almost swam right past it. 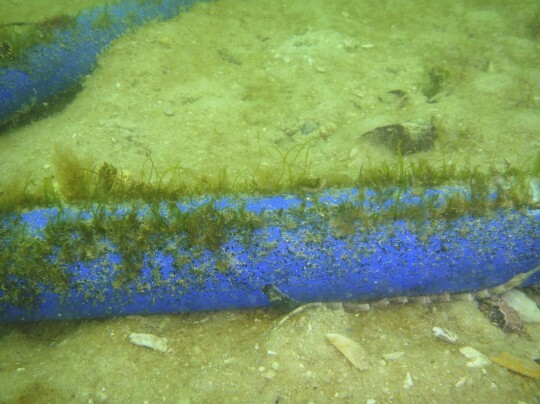 The PVC pipes are almost completely buried in the sand, and algae encrusts almost every surface except for the cable ties. 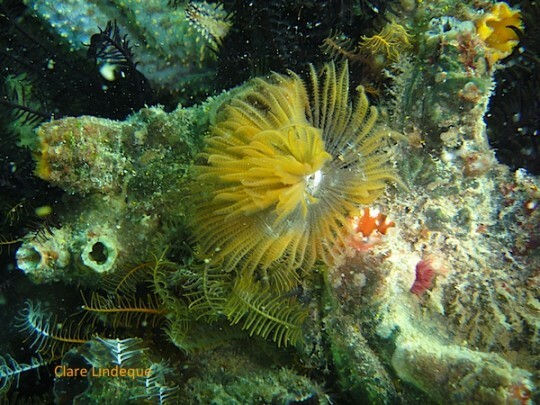 Feather stars seem to have taken a particular liking to the sponges, which have retained their shape (if not their colour) remarkably well. 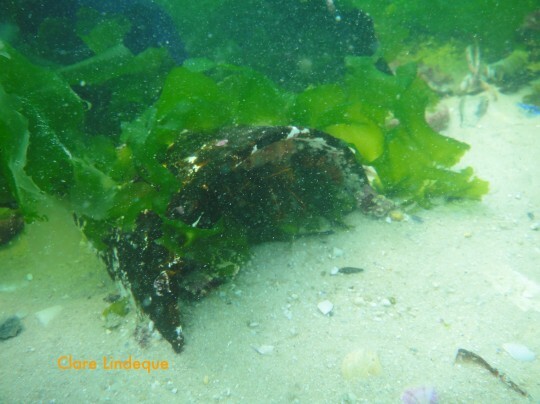 The reef is populated by lots of (shy) klipfish, many of whom take cover in the sea lettuce. One, however, was very friendly and I almost got left behind playing with him on the sand. 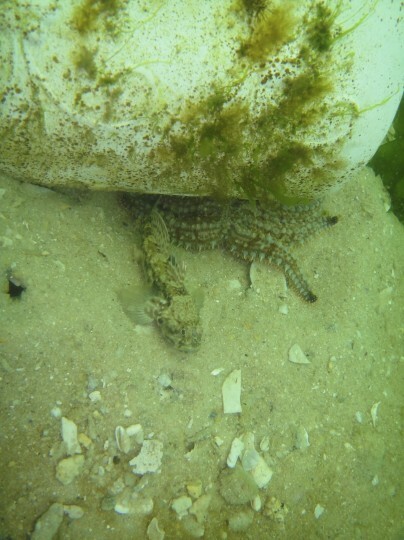 We found a very fat pipefish, and a whole bed of hermit crabs going about their business. At least one warty pleurobranch was in residence, sitting on the wooden box. 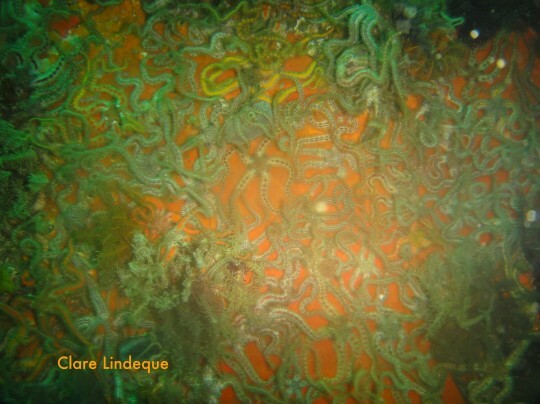 The sign requesting divers not to mess with the reef is completely encrusted with sea squirts of various sizes and descriptions – larger ones as well as the smaller colonical ascidians. It’s not legible any more! We were amazed by how thoroughly the sea has taken over the various items we laid down four months ago. What was originally quite an ugly collection of pipes and other random objects has become a thriving little oasis on the sand. 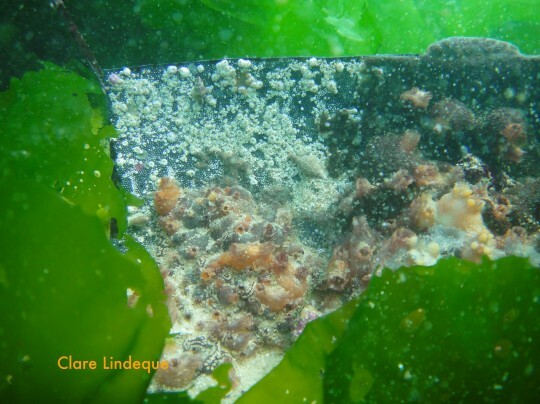 We purposely placed the artificial reef away from other rocky outcrops or detritus that housed copious marine life – out on the sand, we’d be able to see who passed by, and know that the reef was seeded from scratch and not from an adjacent underwater feature. Here’s a beautiful short article on Wired.com about seahorses, revealing research that indicates that their S-shaped bodies give them an advantage in hunting for food over their pipefish relatives. They’re apparently among the fastest feeders known, and their distinctive body shape gives them an extra couple of millimetres of strike range. All the images included with the article were taken at the Monterey Bay Aquarium, where they are currently holding an exhbition called The Secret Lives of Seahorses. I think Tony and I need to pay it a visit! 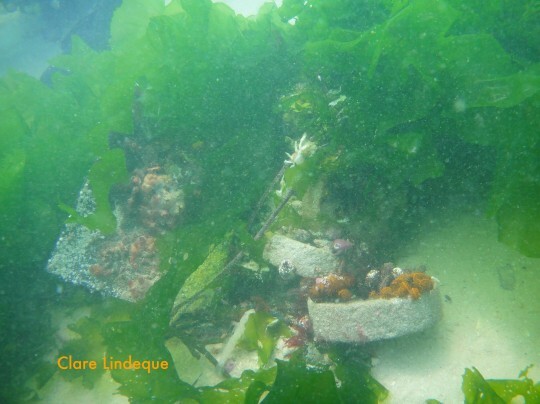 After deciding that an artificial reef would be a cool project to do at Long Beach, Clare, Kate and I installed the reef on 20 November 2010, and revisited it on 30 November. Clare and I visited it again on 17 December 2010 to see how things were progressing. 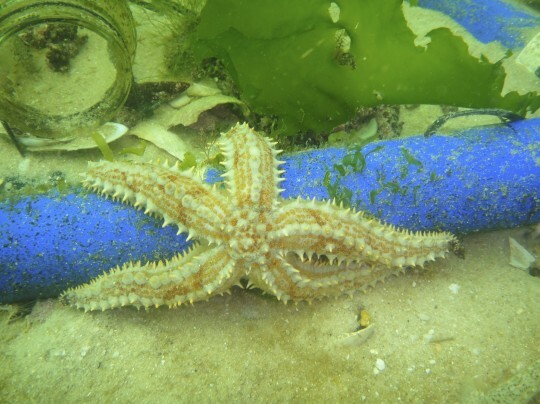 The starfish are still loving the PVC pipes and quite a few of them have moved in. 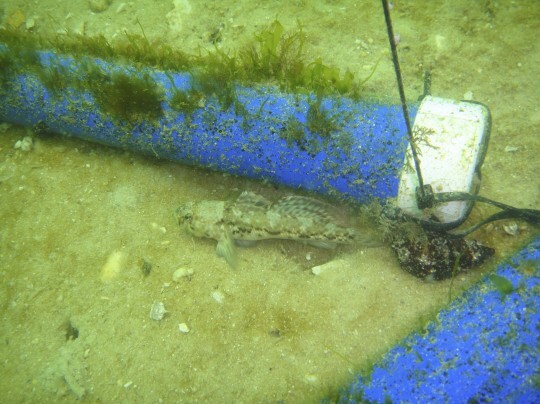 Many barehead gobies are in the area and hide under the piping and other features of the reef. 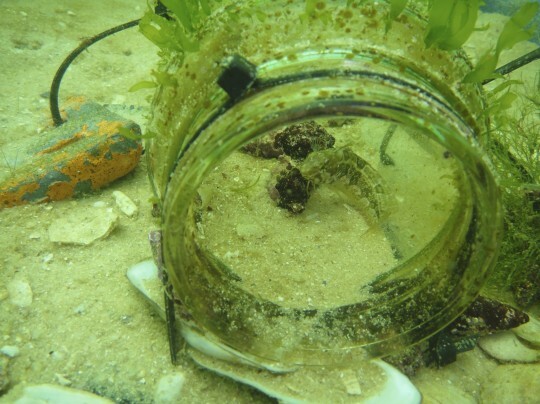 A small klipfish has moved into the coffee jar, which is getting quite covered with green algae and sea lettuce. He seems to feel quite safe in there and there’s lots of room for him to grow. 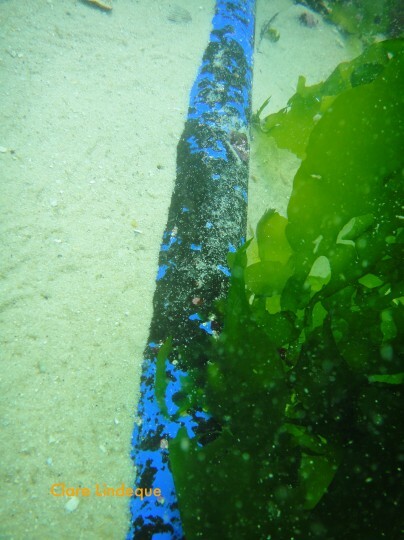 We even found a pipefish snuggled against one of the very green and grassy PVC pipes. Can you see him in the picture below? 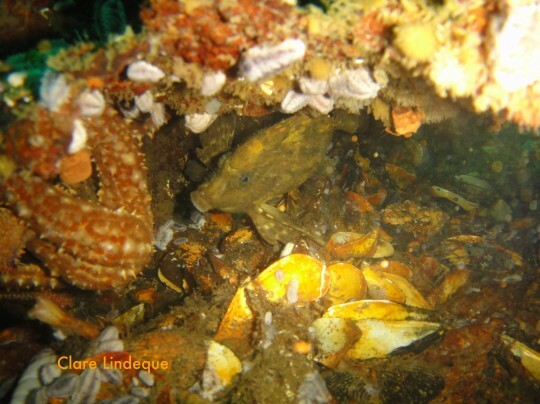 Several hermit crabs have also made the artificial reef and its general area their home. Here is some footage from Kate and Clare’s night navigation dive at Long Beach about a month ago. Look out for the beaked sandfish, the three spotted swimming crab, an enormous warty pleurobranch (very briefly), a compass sea jelly, and a puffadder shyshark who gave me the beady eye. 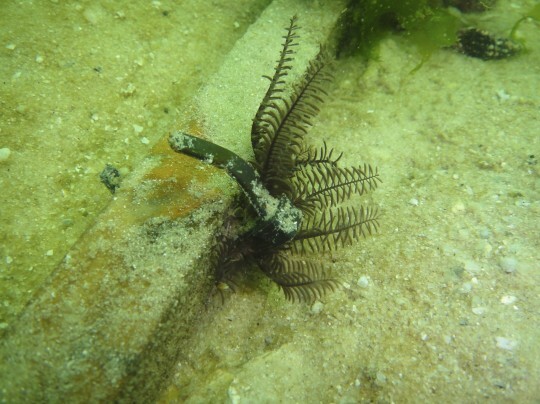 There’s also a pipefish, and a large klipfish to be seen. 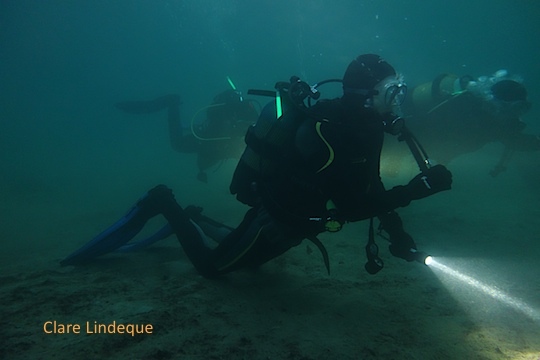 Here’s a rough edit of a lovely dive we did at Long Beach last year (Clare twisted my arm to put this up – I’m not happy with the state of polish of the final version), in 14 degree water with 7 metre visibility. The surface conditions were choppy, as you can see at the end of the video, but under the surface it was lovely. There’s lots to see. Early on, look out for the common sandprawn (the large, white shrimpy thing). We see lots of their discarded carapaces at Long Beach but this is the only one we’ve seen with a sandprawn inside to date. There’s also a huge cloud of fry – not sure which fish species, but clearly the imminent onset of spring was encouraging breeding! 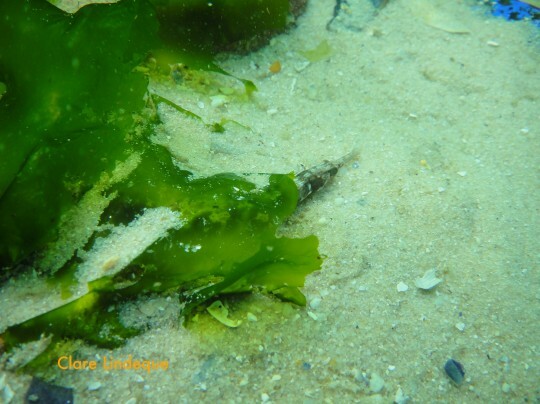 There’s a very brief shot of a chubby clingfish – the small orange chap clinging onto some sea lettuce, of which there is plenty. 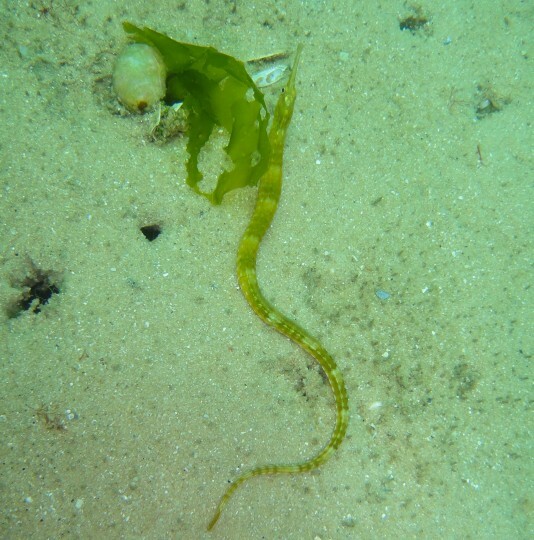 Watch out for the Cape topshell on the kelp, and a nudibranch egg ribbon on some green seaweed. 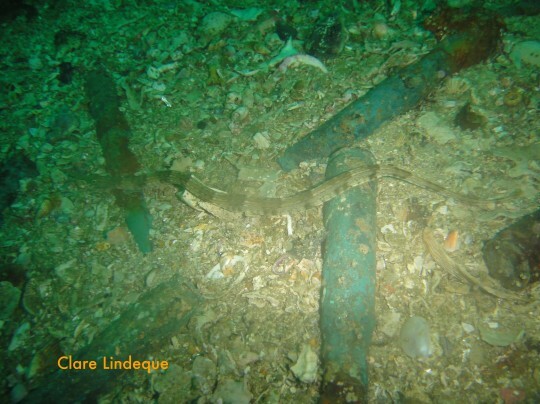 The video concludes with a shot of the inside of the barge wreck at Long Beach. Tony has a soft spot for pipefish – they are related to seahorses (and he loves those), and share many physical features such as the shape of their snouts, and the small (seemingly ineffectual) fins that propel them through the water. Like seahorses, the males incubate the eggs – sometimes we find really chubby specimens with little bulging tummies, and I suspect those are the dutiful fathers. 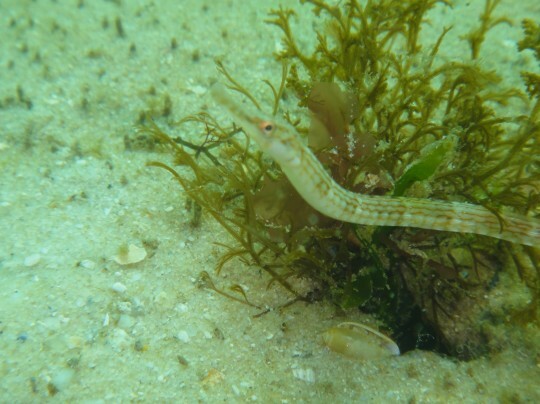 The type of pipefish that we find in Cape Town, the longsnout pipefish, comes in an array of colours, from bright green to brown. 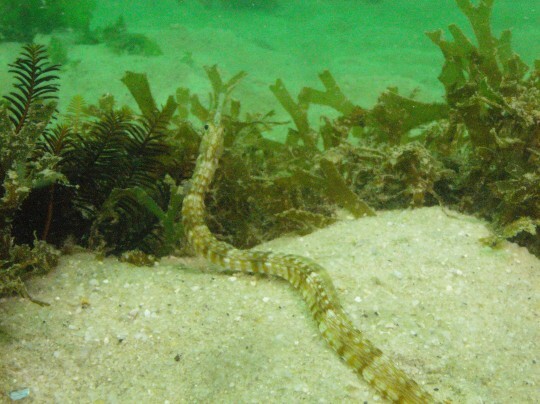 They’re usually spotted curled around a piece of sea grass, but sometimes out on the sand as well. They generally seem very laid back and sluggish in the water, but are capable of whip-like bursts of speed when they put their minds to it. We mostly see them at Long Beach, where there’s lots of plant life for them to hide in amongst.